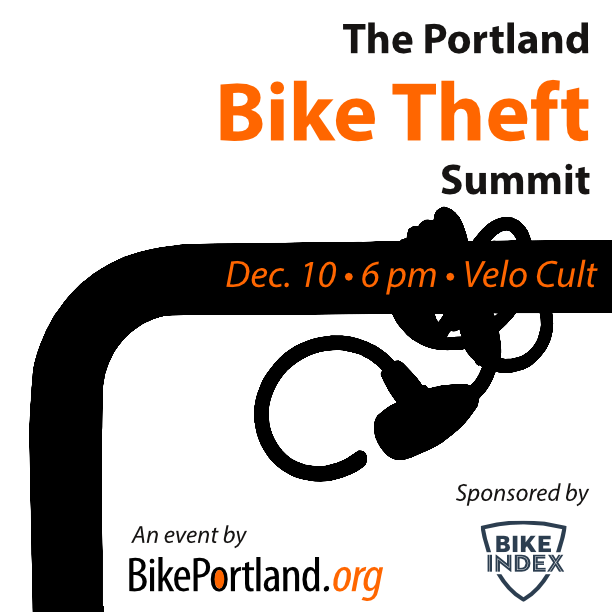 We’re just one week away from the first ever Portland Bike Theft Summit, sponsored by Bike Index. To refresh your memory it’s happening next Wednesday, December 10th from 6-9:00 pm at Velo Cult Bike Shop and Tavern (1969 NE 42nd Ave). Things are coming together nicely and we’re excited to share the event agenda. We’ve worked hard to get all the key local players in the same room to inspire and inform our next steps in the effort to thwart bike theft. If you come to the summit you’ll get to meet other community advocates who are working on this issue and you’ll get to know (and learn from) key players who are in the trenches of the battle on a daily basis. We’ve confirmed attendance from representatives from many agencies and organizations including: the Portland Police Bureau, Mayor Charlie Hales’ office, the Portland Office of Neighborhood Involvement Crime Prevention program, the Bureau of Transportation, Portland Parks & Recreation, Bike Index, Project 529, the Multnomah County DA’s office, business owners, and more. We’ve also connected with local filmmaker Guthrie Straw who’s working on a bike theft documentary. Guthrie will have a “story box” set up to record your amazing tales of bike thievery and recovery. It will be a fun, educational, and inspiring evening. And it’s free! Scroll down for a text version of the agenda or check out the PDF here. Grab a drink and open your mind to bike theft. Take this time meet new crime-fighting partners and record your bike theft story with documentary filmmaker Guthrie Straw. Bike theft is out of control in Portland. It’s a complex problem intertwined with other complex problems. But there’s no reason to feel hopeless! There are many things we can do to get a better handle on it. The first step is understanding the scope and context of the problem, who the local players are, and what solutions might be feasible in Portland. 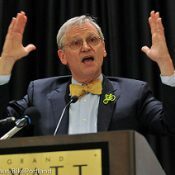 In his opening address, Jonathan will explain his expectations for the summit, present new data to illustrate the problem, and share what he’s learned from over seven years of reporting about the issue on BikePortland.org. Audience members will share their 30-second bike theft stories. With knowledge comes power: the power to prevent bike theft and to recover a bike once it’s stolen. 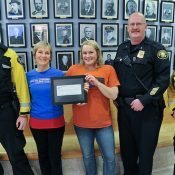 What is Portland currently doing to educate residents about bike theft prevention and recovery? What technology is available to help recover bikes and how can it be improved? Our panelists are experts in the high-tech and marketing side of the equation. Time for Q & A will follow. Let’s hear them! 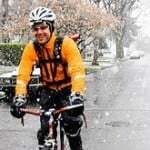 Folding bikes, bait bikes, mandatory bike registration, GPS trackers, explosives, other ideas? Parking is an often overlooked piece of the bike theft puzzle. Rack design, location, availability (or lack of it) and other factors can have a huge impact on security. From the ultimate solution of bike valet to the ubiquitous blue staple racks, this panel will explore how parking impacts theft and what’s being done about it. Time for Q & A to follow. If you haven’t already, RSVP for the event (and invite your friends!) via Facebook. Apologies for the mostly off-topic question but I don’t know how else to inquire. The PDX Reporter smartphone app that many of us use to report potholes, illegally parked cars, etc. does not work under Apple’s iOS8, which many people have upgraded to. Have others here noticed this problem? The App Store reviews are terrible now because of this, which is too bad since it was a highly functional app. Anyone know when/if it will come back online or who to contact to inquire? I’ll try to find the right person to forward your comment to. You can email me directly for follow-up (timo.forsberg@portlandoregon.gov). We are actively working on a new and redesigned version of the app that will fully support iOS 8 and Apple’s new handsets. Coming later this fall. Yup, it’s now useless. Can’t find who to talk to. Open the app, the splash screen that comes up has a feedback email link. I wrote them and got a response (see above). They’re aware and working on it, but it wouldn’t hurt to make a sneaky wheel of it. What are the chances of Bike Index and Project 529 sharing basic data for stolen bikes? Sure would be nice! Far as I know, we’re the only ones doing this. We’re always trying to convince various partners, hackers, .gov types, PD’s, etc. and other registries to use it, and the idea of cross registry search is one that keeps coming up in the discussions with all the other registries. It was the bulk of the first ‘stolen bike summit’ in SF, earlier in the year, FWIW. And while most people agree on the concept, right now we’re the only ones putting the data out there. *snap! * Of course! I hadn’t thought about how BikeIndex’ open API and source would work that way. Now if only 529 and others would (a) take up that offer and (b) reciprocate! I hope to make it to this summit, thanks! Oh, of course! Now that you mention it, I have seen that BikeIndex has open API and source, I just hadn’t put that together with sharing data with 529. Now if only they and others would take up that offer and share in return. I’m hoping to make it there, thanks! Hi Bryan, I tried a quick google but do you know of a website summarizing how the SF bike theft summit went? Curious what came out of that, and if Portland can learn from it. One awesome thing I do see is SF’s police has a bike theft dedicated twitter account. That would seem to require some dedicated resources from the PD, and a good place for the community to spread the word on theft while immediately alerting the police. Attending were reps/staff from SF & CA bike/safety/.gov org’s, local biker extraordinaire @plattyjo, @sfpdbiketheft, bike registry folks, and some civic hacker / bike community coders. Large part was just round-tabling and introducing who we all were & what we had to offer each other in the way of fighting bike theft. And that ranges from sharing data, points of contact, shared programs + efforts, technology (like our registry) or even just higher level explanations – for example @sfpdbiketheft spoke re: the legal / procedural side & the various details on bait bikes, enforcement, chasing thieves on Craigslist, the general state of the problem w/ crime and enforcement in the city in the light of recent CA legal changes — he was really, really illuminating. This is why I’m happy Jonathan has focused a block on enforcement for the PDX summit – I think people will be really surprised @ some of the details around enforcement. Did Craigslist themselves participate in the SF summit? I know they don’t have the resources to actually police their site, but it does play a MAJOR role in bike theft — a very large share of bikes listed on CL have been stolen — and it seems they might be able to play some role in reducing it. At the very least, CL’s “avoiding scams” page could mention that a lot of bikes listed there are stolen, and offer generic tips on avoiding buying stolen ones, including checking the serial number against bike registries. No, Craigslist did not participate. There was much discussion there on many of those topics – all of which you’ve hit squarely on the head. Everybody across the board wants them to step up and do something about the problem. And they remain silent on it. Super long topic, could talk about this one all day. I would think “all the players” could or should include a spokesperson from the homeless community where a lot of the crackdown effort may take place. I hear you Edwin. Obviously the agenda doesn’t include “all” the players. I should have written “many of the players.” And I agree with you that it’d be great to have someone that works with homeless people and/or lives on the streets themselves. I just don’t have any contacts like that right now. I’ll try to track someone down. If you have any names, please pass them along. Thanks. …so perhaps more discussion on how to involve representatives of the “houseless community” on this topic would be merited…at a future summit or at the next stage once “we” as a community (of bike owners etc.) develop a shared vision / goals / and objectives to reduce bike theft in this region. would the banking industry invite “bank robbers”/ representatives of crime syndicates to a summit looking for solutions to bank robberies? That analogy doesn’t work for me because, unlike bank robbers who are by definition the bad guy, homeless people in general are more often victims of bike theft than they are the actual thief, and bike thieves include both homeless and homed people. But yeah, it’s quite a full agenda as it is, and trying to solve all the related social issues at one meeting is a recipe to get nothing at all accomplished, so maybe an advocate for the homeless could be invited into the discussion at another point.